I should get into production in 2013. I replaced 120 Dupuis with Monroe in 2010-2011. It is one of my favorite late fruit here in Florida. From late November to January. Decent producer. In 2012 got a few fruits in the two lbs range. They say is more cold resistant that other varieties but in a recent cold event in December 2011 It got burned like the rest. Time will tell is this was a good move. January 18, 2013: I just finished top working and additional 90 trees with Monroe for a total of 210 trees I don't expect any decent production until 2014. There was some production, but with the wet summer we had and the fact that I did not spray the fruit was not worth picking. March 28, 2013: The 120 Monroes top worked in 2011 are large and producing. They are in the middle of the flowering now and they are setting a large amount of fruit. Some of the trees are 15-20 tall and can hold a lot of fruit. Impressive to see them. No wonder this is the commercial late fruit of choice, productive with excellent quality. May 15, 2013: A lot of scab on the fruit. Has been sprayed. October 20, 2013: A lot of fruit survived, Took 3 copper sprays to get clean fruit. This is undoubtedly the industry late fruit workhorse. I should have a decent crop out of the first batch of 120 top worked trees two years ago. The beginning picking day is in about 10 days and I have huge fruit in the trees. I picked one today over the 40 oz. A monster fruit, see picture. November 8, 2013: The season for Monroe started. Because the trees are small I wanted to relieve the pressure of the fruit on the tree so I had about 80% of the fruit picked. I was surprised when it cam in at 65 lbs per tree. Great for the first year. January 6, 2014: Fruit is beginning to drop, so I will probably finish picking the remainder of the fruit in the tree this week. However If I wanted to tolerate some more fruit drop the trees would probably hold fruit to the end of the month. September 22, 2014: The Monroes have set a nice crop. The trees look full of fruit. They are very clean this year. We started spraying earlier and this was a drier summer. This is a very productive variety, with great taste. I could not resist picking a 35 oz fruit way before its due time of mid November. I hope it ripens well. September 24, 2015: The Monroe is an excellent constant producer. 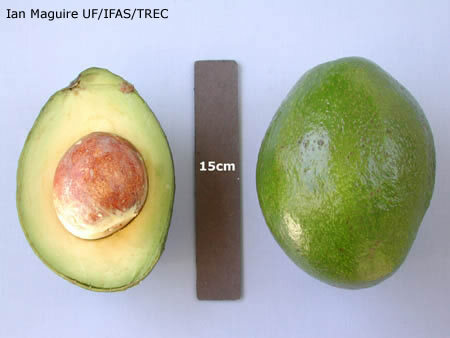 Not only is one of the best tasting avocados I grow but is a good producer every year. The trees are loaded to the point of branch breakage. See today's picture.